I’m hearing a lot about fake news these days, that we need to beware of fake news on the Internet. The irony is bitter because this warning is coming from the masters of fake news, the media outlets like CBS, ABC, NBC, and the New York Times; the very propaganda organs that for the last 16 years or so have been looking us in the eye and telling us that mostly hollow aluminum jets can bore through concrete, burrow into the ground, and sever structural steel box columns like a hot knife through butter. All it takes is to scratch the surface of 9/11 to realize just about everything peddled about that fateful day was and is indeed, “fake,” but it’s not just the authorities pushing fake news, even the 9/11 Truth Movement prefers fake truth rather than the real thing. In reality the rank and file within the truth movement seem quite content with the belief that the truth will never be known, which makes me wonder why they call it a truth movement in the first place. It is this hypnosis that has kept the war on terror going strong, with both sides so entranced they will reject the evidence that can lead to the truth in favor of fantastical explanations straight out of Gene Roddenberry’s imagination. The truth is, no, planes can’t slice steel and no, buildings don’t turn to dust in the real world. For 16 years both sides (all sides), have bent over backwards to avoid the first step in any investigation; the scene of the crime, probably partly because it makes most of the truth movement’s hypotheses irrelevant, but also because of the staggering implications that accompany it. Years ago a friend warned me that even if I did discover the truth about 9/11 nobody will give a damn, a prescient prediction. Not that I’m saying I’m right, but I have done my best to keep myself honest in my investigation, and although I am often wrong, I am also often not wrong. All I can say is, the fact that no one will address these clues is exactly what I would expect from controlled opposition if I did stumble on the right path. Fake news is everywhere, but from what I can tell most people like it that way, truthers included, which is a pity. The truth may hurt but it really does set you free. My wife is a big fan of crime scene reconstruction shows, like CSI and NCIS. 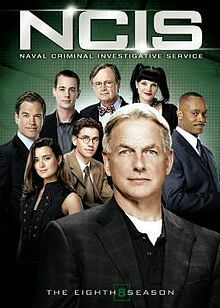 Although fictional, and usually heavy with government propaganda, these shows demonstrate crime scene reconstruction to the audience. Often, even the tiniest clues can change the whole course of the make-believe investigation. In the real world, students of forensic sciences are taught that crime scene reconstruction is used to determine the actual course of a crime by limiting the possibilities that resulted in the crime scene, or the physical evidence as encountered. “the use of scientific methods, physical evidence, deductive reasoning and their interrelationships to gain explicit knowledge of the series of events that surround the commission of a crime”. In other words, to discover how a crime was committed the investigators will collect all the information they can gather from the scene and with what is learned from that evidence formulate a theory as to what happened. 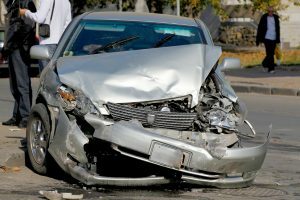 Physics plays an important role with identifying directions in splattered blood, bullet trajectories, vehicle crashes, fires, and building collapses. 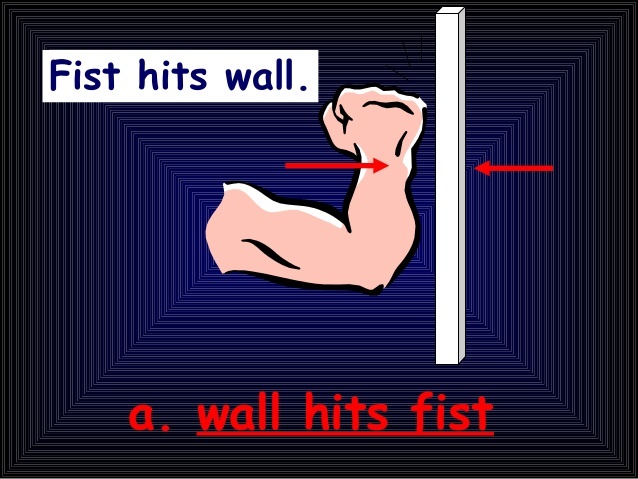 This means that in a collision between two objects, both objects experience forces that are equal in magnitude and opposite in direction. If you hit a wall with your hand the wall hits your hand just as hard. It’s not rocket science. 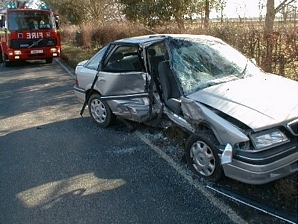 and this car was struck from the side. 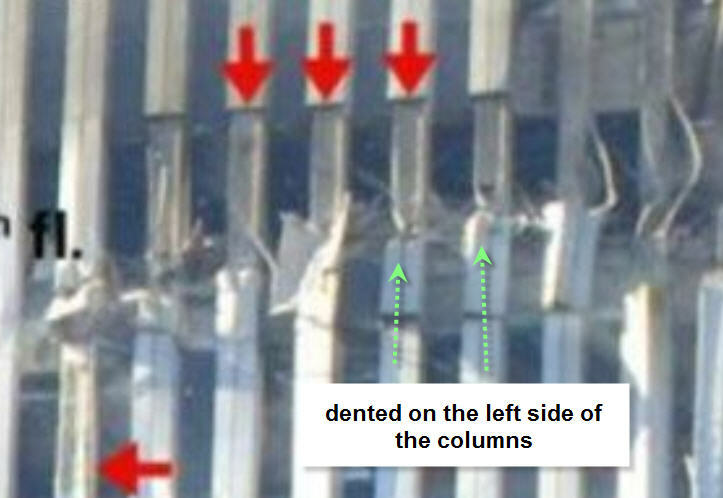 Any kid who has ever run a stick against a picket fence can attest that whatever hit these columns struck from the side as well, you don’t need a physicist to explain it. The dimensions of the towers were well documented therefore one can accurately estimate the size of the projectile. The columns were steel boxes shaped like this, with the sides of the box protruding past the face like laterally-braced steel knives. It is these protruding sides that can be seen sharply bent to the right in the image below with the face flattened between them. The direction of the bends is an indication of the direction of travel of the object that struck them. Equal and opposite, and all that. The cladding was thin aluminum sheeting that was installed in twelve-foot sections, demonstrated in this video at about the 8-minute timestamp. …but a few feet away it was massive enough to gouge and bend steel columns in a completely different direction than the wing was traveling. and if the mostly hollow aluminum wing with a leading edge as sharp as a basketball was somehow able to slice through the sharper, more dense steel of the exterior wall columns the damage evidence would be consistent with it. The steel would bend south, not west. Also, if we believe what we are told by the authorities, then as the wing was slicing the steel, it was being disintegrated by the steel at the same time. This means that by the time the alleged engines penetrated the columns, the wing tip was no longer attached to the rest of the wing. 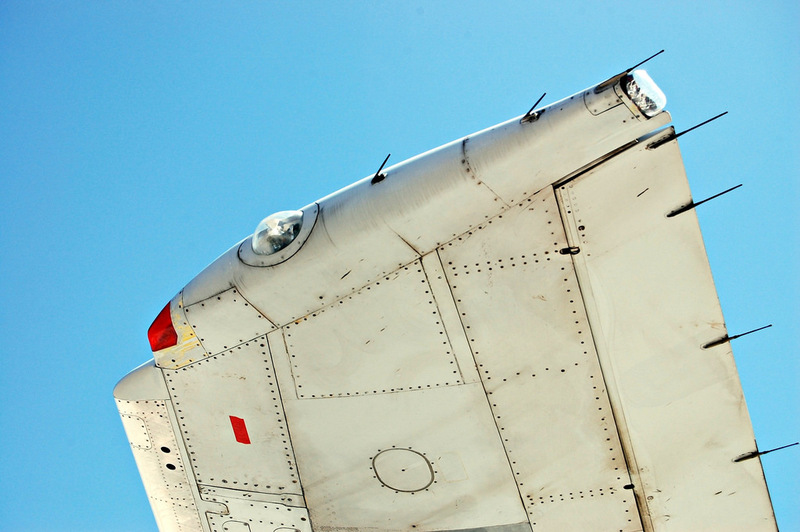 Coincidentally, that is the same part of the wing that the damage evidence indicates took a sharp turn to the right. …despite the fact that the alleged plane impacts were at completely different trajectories. Why this evidence is ignored by the truth movement should be obvious, because it eliminates most of their arguments. Many truthers have books to sell, and everyone has a donation button. 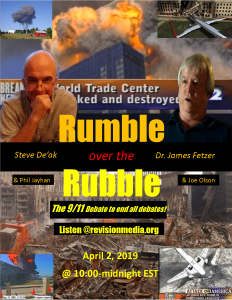 Over the years AE911T has collected millions of dollars in donations from concerned truth seekers who believe they are helping to expose the truth, when in fact they are suppressing it and funding Richard Gage’s $85K annual salary . Judy Wood, Richard Gage, Rob Balsamo, Christopher Bollyn and the list goes on all refuse to address this evidence because there is only one explanation for it, and that explanation isn’t a part of what they’re selling. This off-limits evidence eliminates all the videos of the plane impacts as genuine in one fell swoop, and it exposes as false prophets in a bogus movement those who refuse to address it. For too many years the veracity of the videos has been debated; whether or not they were all faked or if only some of them were faked or if none of them were faked, despite the evidence that answers that question definitively. Could it be that wasting time has always been the goal of the 9/11 Truth Movement? I ask because had they begun their investigations at the beginning by examining the scene of the crime, they could have cut to the chase on September 12th, 2001, and avoided a decade and a half of the silliness we were given. Personally I think the biggest reason the truth movement avoids the truth is because to acknowledge it would expose all the world’s media as complicit. Very quickly after that comes a paradigm-shift of awareness, followed by inevitable soul-crushing depression, and for those who make it out of that phase they can look forward to losing faith in authority, as well as in society, followed by being labeled as crazy and outcast by friends and family, followed by generally being a stranger in a strange land. I don’t blame people for “not going there,” who would want to put themselves through that? Nonetheless you can’t call yourself a truther if you avoid clues that discredit your argument. The truth is what it is; if your hypothesis doesn’t account for the evidence at the scene of the crime then you need to head back to the drawing board. I shouldn’t need to address any of the video evidence at this point; the damage evidence mentioned above is enough to discredit all of the jet impacts all at once. How they faked them is irrelevant and beside the point of what the impact evidence shows. 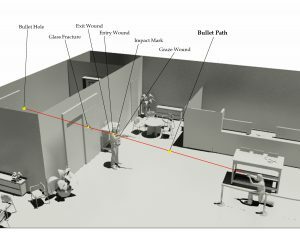 It doesn’t matter how many “official story” witnesses or how many “amateur” videos they trot out, their claims don’t change the evidence of lateral impacts from small projectiles. Besides, in this day of 3D movies and digital animations it should be understood that the videos of the jets are a piece of cake to fake. Nonetheless, most people will still assume the damage evidence is somehow wrong and the videos depict a real event, therefore I will explain how I would have done it if I was in their shoes. It is very important to understand the timeline; none of the so-called “live” shots of flight 175 show the impact, meaning all of the shots that were broadcast live depict what appears to be a plane flying behind the towers, followed by an explosion; but no collision. No one ever saw the impacts live on television. Anyone who says they did, is mistaken. Those clips that do show the plane sliding like butter into the steel building were all released later, they were not shown live as they happened. A logical conclusion and one that fits the damage evidence is that the ‘amateur’ footage was released later because the small army of propagandists that was deployed to pose as amateurs, needed to record whatever it was that actually struck the towers before they could edit it out of their respective footage, and edit-in a jet. 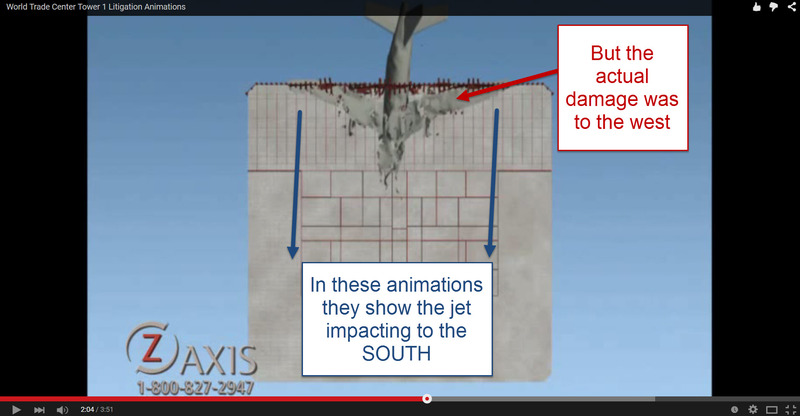 Furthermore, all the videos of the plane impacts show anomalies that indicate they are fraudulent, every one. Comparatively though, all the images and videos of the explosion (AFTER the impact) are consistent from video to video and photo to photo, which to me is another critical clue. If as the evidence indicates the videos of the plane-approaches and impacts are phony, but the videos of the explosions are real, then it stands to reason they stitched together the fake video with the real video at the point between where the last of the plane entered the building, and point when the fireball erupted. This explains why the planes penetrated fully before they exploded, being just a video layer of a plane it would have overlapped the explosion layer, which would have immediately exposed the fraud. For their ruse to work the explosion had to be real. 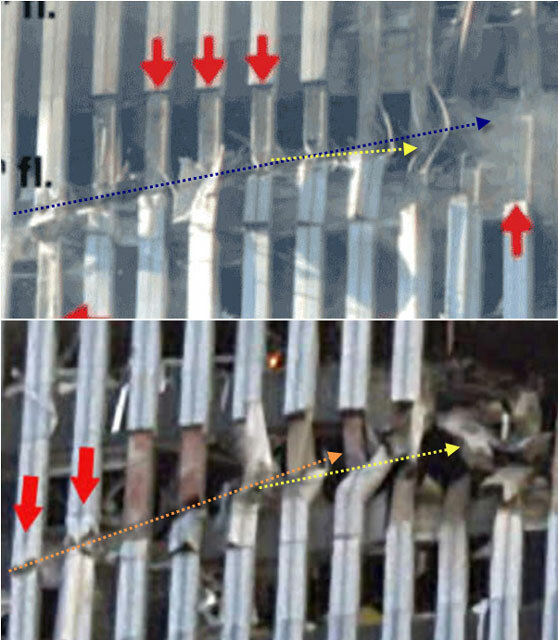 Since all eyes were on the north face of the North tower, how many “real” amateurs would have been training their cameras on the south face of the South Tower when flight 175 struck? Any real witness that caught a photo or video of the explosion would be able to verify their images with the images of the explosions in the public record, and would simply assume they missed the plane. But even if someone did see what really happened, and still didn’t get the clue that the authorities were at fault, where would that someone turn if they wanted to report it? To the police that planted the plane parts? To the fire department that set fire to the cars? To the media that broadcast fraudulent video? To the government that was about to declare war on the world? Even if they did report the truth, why would the authorities tell we the people when they were selling us a terrorist attack? After the first crash no one knew what had happened, but most of the reports were that something other than a large plane had struck; people reported small planes, missiles no planes, and one news executive reported a large plane. 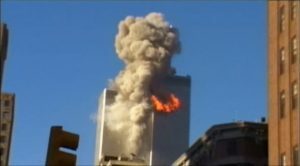 It was after the 18 minute mark when the “live” reports of flight 175 were broadcast, but as explained above none of those videos show an actual impact, they all show a jet animation flying behind the towers, followed by the big explosion. It was only later in the day, and days later, that the footage showing the impacts to the South Tower were released, and that’s because video editing takes time, even though it is much easier to edit real footage than it is to create completely fake footage. 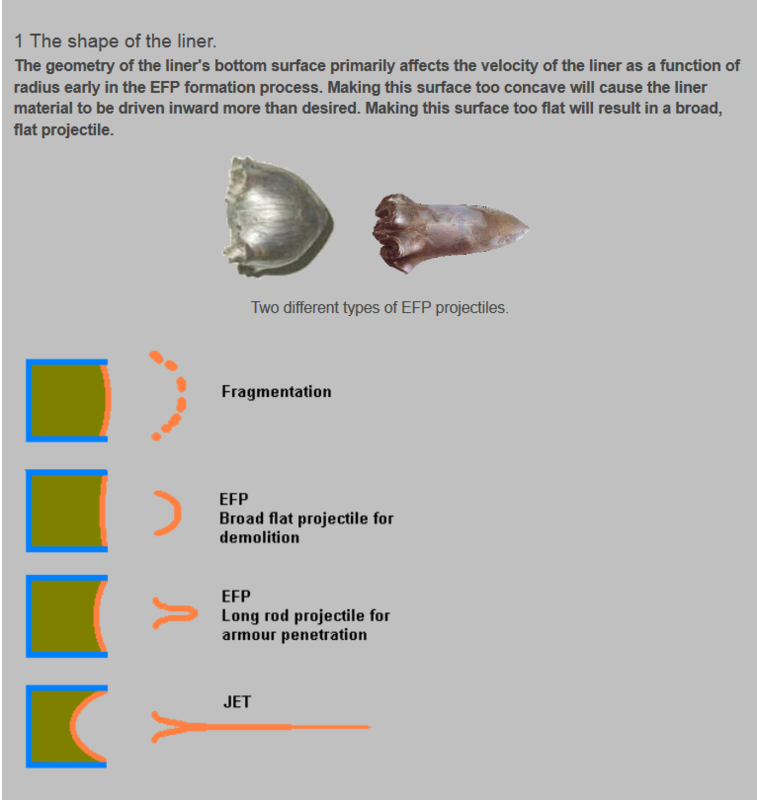 Many truthers insist 9/11 was all CGI, which is an acronym for Computer Generated Imagery, but that makes no sense at all because if they had full control over their set, they surely would not have included evidence of the lateral impact of small projectiles when they were showing us the head-on impact of a large one. Besides, a CGI world would not match anyone’s experience who could see both the twin towers with their own eyes, and the TV show. Thousands may have seen the explosion, but nobody saw a plane melt like butter into the tower because as the damage evidence shows something else happened. Below are some explanations from Adobe regarding what is possible. Compositing: Joining images together in space to make one image, almost always after cutting out some of the areas of each. Video editing: Joining pieces of one or movies together in time to make one movie, almost always after cutting out some of the duration of each. Motion graphics: Moving images around in space and time, almost always after creating some of the images from synthetic, graphic elements. 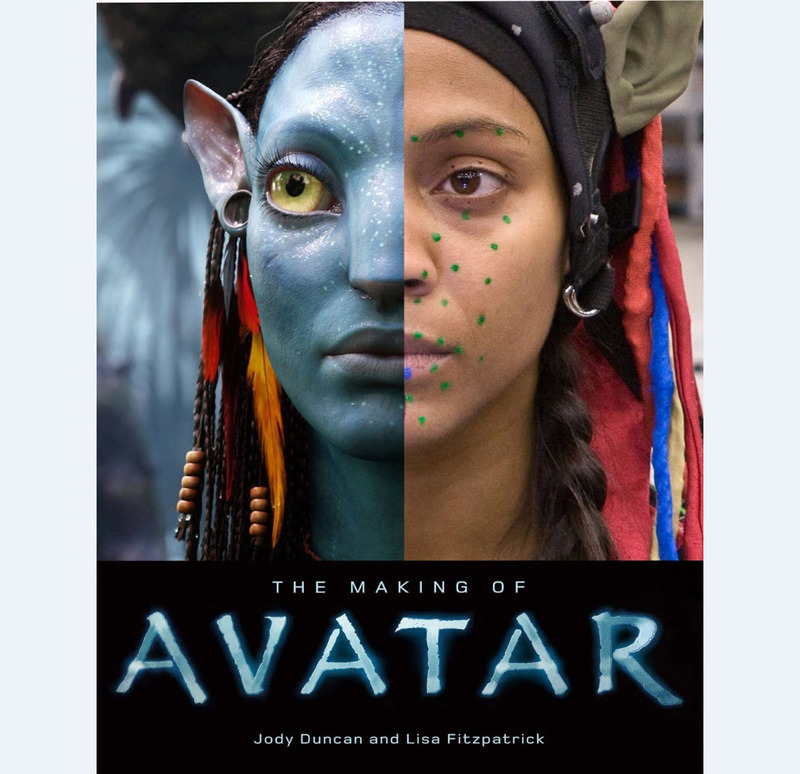 BTW, visual effects is kind of a splash of motion graphics with a lot of compositing. Video layering is explained here. Tripods when used for photography make rehearsing shots and manipulating videos much easier, and it turns out many of the “amateurs” were using them, even some of those that claimed were not using them, like Michael Hezarkhani. In this footage he can be seen panning around acting like an amateur with a handheld camera, but this guy’s a pro with a tripod. Evidence of that tripod use can be seen just before the “jet” enters the frame, where he locks in his well-practiced position for a split second before he pans up to capture the imaginary jet that he would edit-in later. 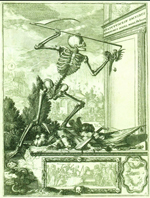 They used layer masks to cover up the real means for cutting the holes. It was very much like the camera spoof you’ve seen a dozen times before in crime-caper movies like “Hudson Hawk,” where the criminals will hack into a security camera-feed to project an image of the safe to the guard, while they’re actually breaking into the real safe. Layer masking is used by movie magicians to make things appear and disappear on film, and on 9/11 it was used to make it look like a plane cut through a steel tower. 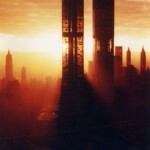 To accomplish this feat they had to use tripods to first capture footage of the undamaged towers, from the exact same location as they would capture the fireball. They used the footage of the undamaged tower as their “mask layer,” like a curtain to hang in front of the live footage of the real tower. 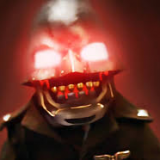 Once the real footage was hidden behind the mask layer curtain, the holes in the tower could be cut, and only when that was accomplished could the mask layer be removed, exposing the damage. The plane was just another layer on top of the mask layer, both of which, the “undamaged tower” layer and the “plane” layer, were hanging in front of the real layer, giving the audience something to look at while the real hole was being cut. 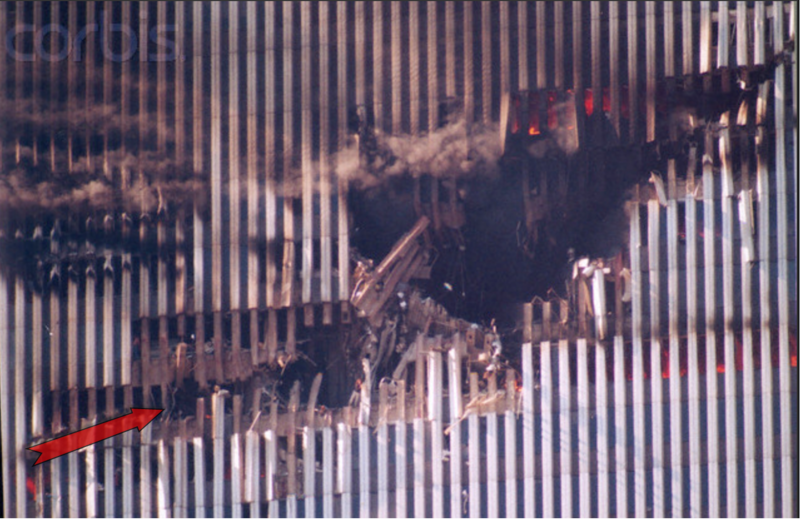 After the plane layer melted into the undamaged tower layer (accompanied by drawn-on smoke), they faded away the layer of the undamaged tower, to expose the live footage of the real tower behind it. From that point forward, it was a real-time play. The plane didn’t crumple and explode on impact because it was nearly impossible to create a convincing 3D animation that could be shown from multiple angles; they were limited to using what 2D means they had, and that was layer masking. This is why the “flame gash” seems to appear out of nowhere, because that was when they faded-away the mask layer to reveal the real hole. 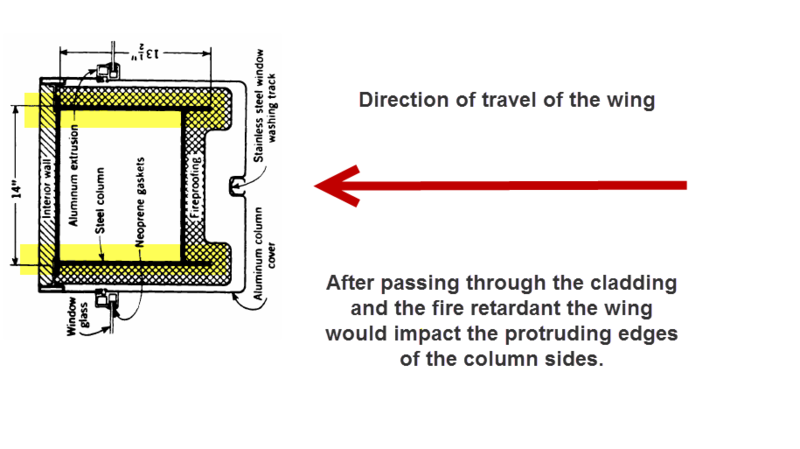 And this also explains the phenomenon of the plane entering the building completely before exploding, because otherwise the plane layer would have masked the live layer of the fireball and spoiled the illusion. Naudet and by Hezarkhani both claimed they were using handheld cameras, which their own footage proves is false. Compare to the the Naudet footage with the Courchesne footage, and you’ll see the same methods, crappy video with terrible animations designed to both mask the real means used and to give the truth movement something to talk about for the next couple decades. By writing the anomalies into the script, they could control the direction of the opposition before it even began. What Could Do the Deed? Faking the plane crash videos was the easy part; the tricky part was that something still had to cut the holes in the towers, and do so convincingly enough so that people wouldn’t think they were cut with planted explosives. As far as I can tell to solve this problem they only had five options. Some truthers might argue that there is secret technology that can account for it but none can explain what that technology is, or how the damage is consistent with it, so I’ll stick with means known to exist. For the record I started investigating the impact damage because I was certain it was caused by planted explosives, and I wanted to discover which explosives could do the deed, but to be fair I’ll address all the options. 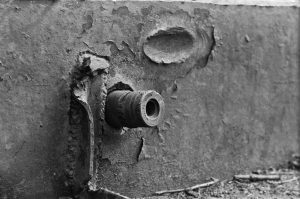 Artillery would be far too powerful to account for the bends to the steel. Artillery can easily punch through steel, but for example a 155mm howitzer round travels about 1,847 feet per second. 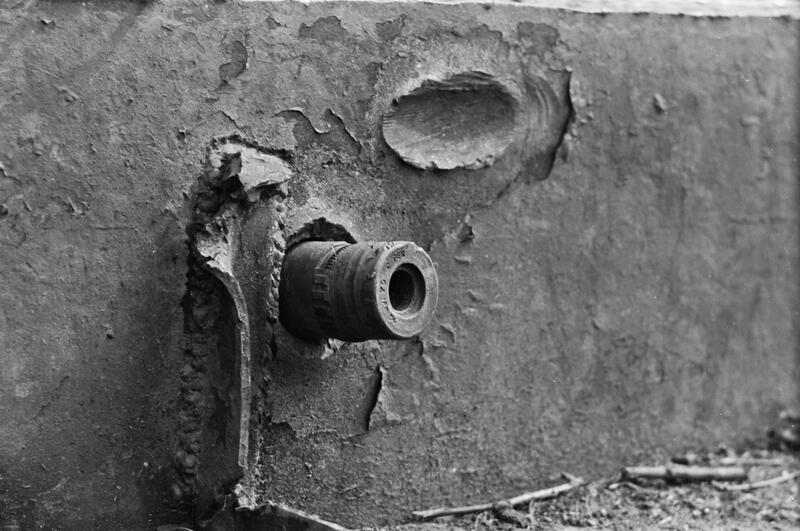 A solid shot artillery shell traveling that fast would have cut right through the columns, leaving a telltale hole, therefore something bigger and traveling much slower than artillery was responsible. 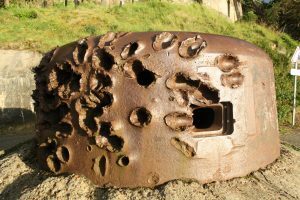 As can be seen in these photos of the damage left by solid shot artillery rounds in WWII, they would be quite recognizable in the WTC. Artillery can be taken off the table. 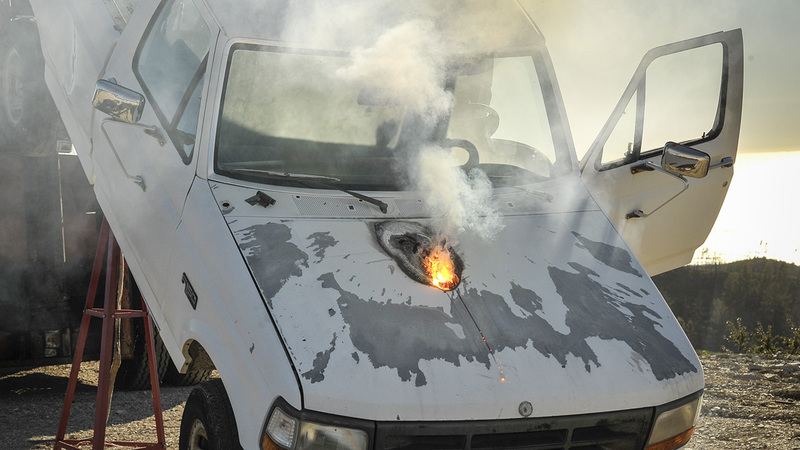 When I refer to directed energy Weapons, or “DEW” I include such technology as lasers, microwaves and particle beams. A laser would be more appropriately used as a guidance system for a missile than as a possible culprit for the damage to the twin towers. Since laser weapons super heat molecules (they don’t bend steel), they are easily eliminated from the list of possibilities. Metal actually reflects microwaves, therefore a microwave weapon would be completely inappropriate for use on the WTC. 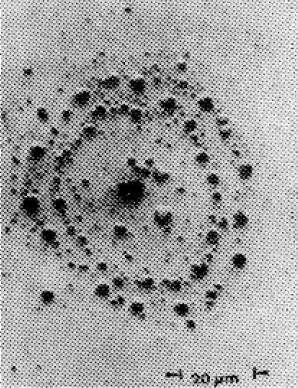 Particle beams can cause kinetic damage, but not like what was seen in the impact holes, and are therefore not a likely suspect. Directed energy weapons are very popular with the generation that was weaned on Star Trek, but alas there is no evidence they were used to cut the holes in the World Trade Center, and therefore can be eliminated. Explosives are hands down what most “no-planers” think were used for the impact holes. I was once on that bandwagon, but it was while investigating what explosives could bend the steel like that I discovered the answer; none. Shaped charges can slice through steel like butter, and have been doing just that for generations, but they are not designed to bend it. 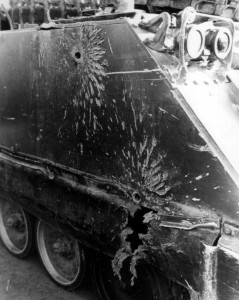 Even if they could be used to bend the steel, they would have used them to mimic the head-on impact of a large jet, not the lateral impact of multiple small projectiles. 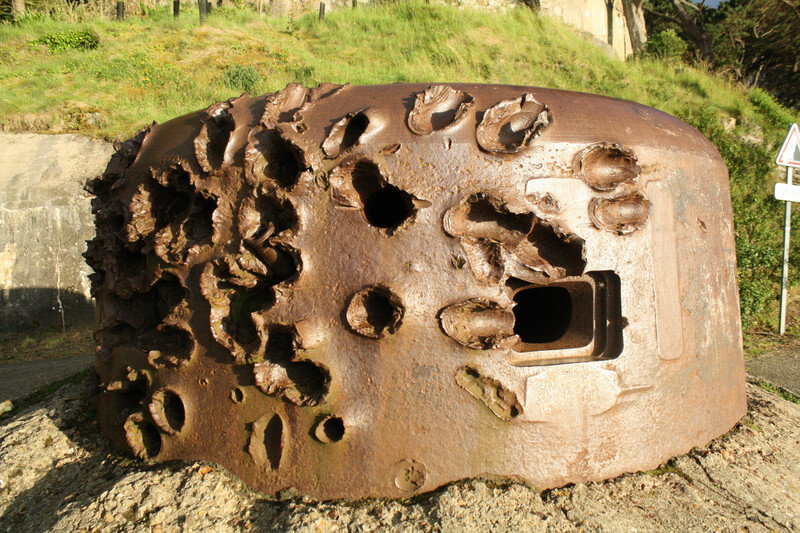 It makes no sense to have precision munitions create the evidence as seen, therefore logically, the damage indicates exactly what it appears to indicate; that these columns were damaged by a dense object or objects, striking from the side. 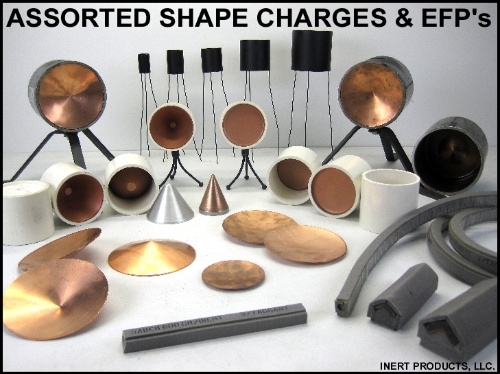 A shaped charge is a concave metal hemisphere or cone (known as a liner) backed by a high explosive, all in a steel or aluminum casing. 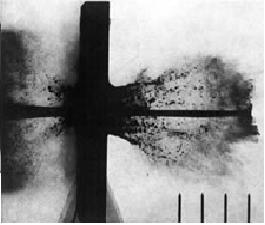 When the high explosive is detonated, the metal liner is compressed and squeezed forward, forming a jet whose tip may travel as fast as 10 kilometers per second. 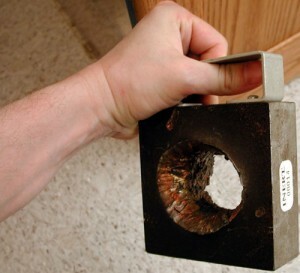 Shaped charges are used in missile warheads, artillery shells and in IEDs for a reason; they are excellent at cutting through steel and armor, but the damage left by them can be easily identified and is entirely inconsistent with the damage visible to the left sides of both holes in the twin towers. 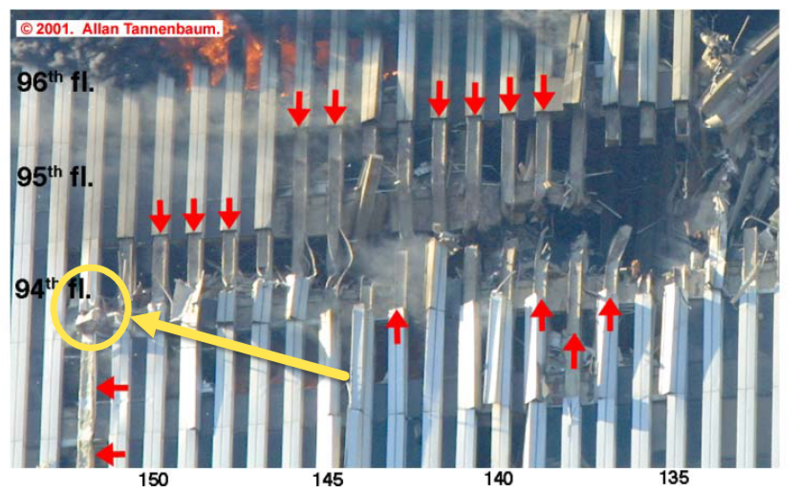 In addition to the bent steel, the lightly damaged cladding at the far left is proof enough that explosives alone weren’t used. This pinch is evidence of a physical impact by something small, and not very dense. Equal and opposite reactions tell me something small and not very dense struck at the far left, but it became much bigger and much more dense as it moved to the right, where it struck and sharply bent steel columns to the right. As far as I can tell there can be only one answer. Most people immediately discount missiles because they assume thousands of people would have seen them, and would have reported them to the authorities. This is a circular argument because if missiles were used, then they would have been launched by the authorities the witnesses would have reported them to. There may well have been thousands of witnesses but why would the authorities tell us about them, when they were selling us planes? Even so, early-on some witnesses did report seeing and hearing missiles, as well as no planes, small planes and big planes; but only one of these options can account for the damage. For perspective as to what the assumed thousands of witnesses might have seen, here is a flyby of an American Tomahawk cruise missile in Iraq. 1.3 million dollars of our tax dollars bringing peace to brown people everywhere. Unlike the people in Manhattan, who were likely not expecting to see cruise missiles, the photographer in this clip was ready for this flyby. Imagine being in the canyons of the city, a thousand feet down, distracted by the hustle and bustle around you, why would you look up, and even if you did see something, would it have been anything more than a blur? The first strike happened on the North face of the North tower when no one would have been watching, but the second strike struck the opposite face of the South tower, resulting in the impacts being MISSED by the “live” TV broadcasts. So if THEY missed them, why is it assumed thousands of people saw them? As mentioned earlier, it wasn’t until later that the impact footage of flight 175 was released, enough time for the operatives to capture footage of the missile impacts, and then edit-out the missiles, and edit-in a jet. It was after the hole was cut in the towers that the mask layer was removed, to expose the secondary shock and awe explosion erupting through it. 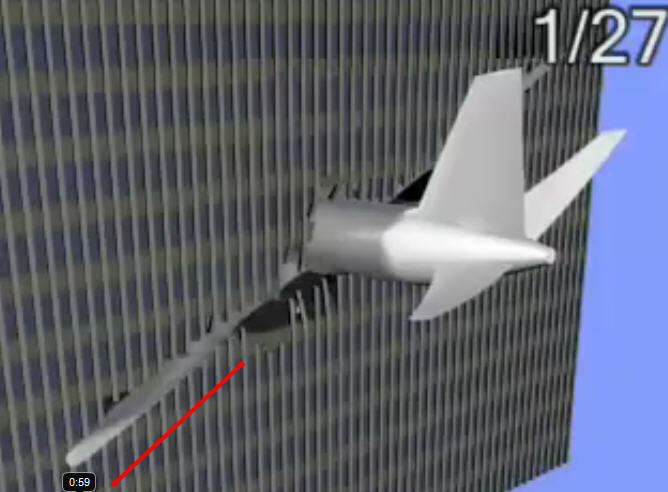 As it turns out the majority of the allegedly amateur footage that captured flight 175, as it effortlessly penetrated the south face of the South Tower, was captured by media professionals. This makes sense, from a covert operations perspective, to have dozens of independent professionals providing the footage to bolster the assumption that thousands of people witnessed the jet impacts live. It is also believable that those media professionals would have a camera handy, since this was before everyone had one on their cellphones. In the event that any real media professionals and witnesses did capture photos of a missile, and gave the authorities the film, they would probably never see their footage again. If it had been me, and I had footage of a missile impact, but turned on the television to see representatives of the FDNY, NYPD, FEMA, OEM, the White House, FBI, military, and media all talking about planes, I would probably get the clue that now would be a good time to destroy that footage and never mention it again. On the other hand if any of the footage of the plane impacts that the amateurs provided turned out to be fakes, that person could be thrown to the wolves and discredited as a struggling artist with bad judgment who was trying to capitalize on the tragedy. Besides, witnesses also said they saw missiles, in fact there were many reports of missiles being launched from the Woolworth building. 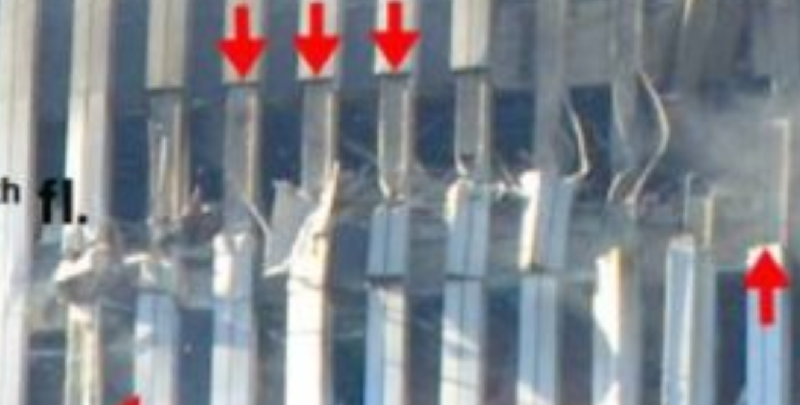 Interestingly enough, if you follow the trajectory of the bends in the steel in the North Tower away from the damage, it goes right past the Woolworth building, which from the street might look like they had been launched from there. Both towers show almost identical left-to-right damage. Eight progressively worse-damaged columns followed by an inward blasting hole, nowhere near where the jet engines would have impacted. The only weapon I’ve found that can accomplish all of this damage is a bunker busting cruise missile designed for punching through hardened targets before detonating. Only kinetic weapons such as these are of the right size, and capability to cause the bends both to the steel, and to the cladding, and they also carry explosives that can account for the shattered columns and spandrel damage. AGM-86D missile warheads are about 14 inches wide and weigh 1200 lbs, they are big, powerful missiles that have been around for decades. 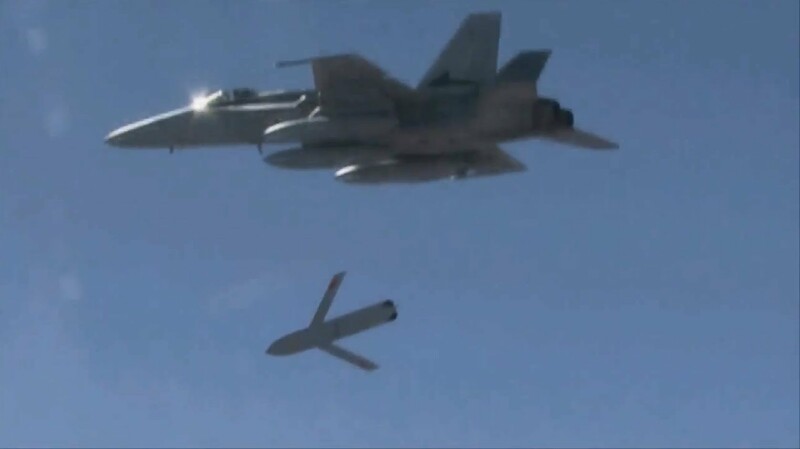 The smaller AGM-158 looks like a plane and in 2001 no one had ever seen one before, but if someone had seen one it could easily have been mistaken for a small, white plane. JASSMs were being produced for testing and for the Pilot Production models in 2001, but they were not in the military’s inventory at the time. 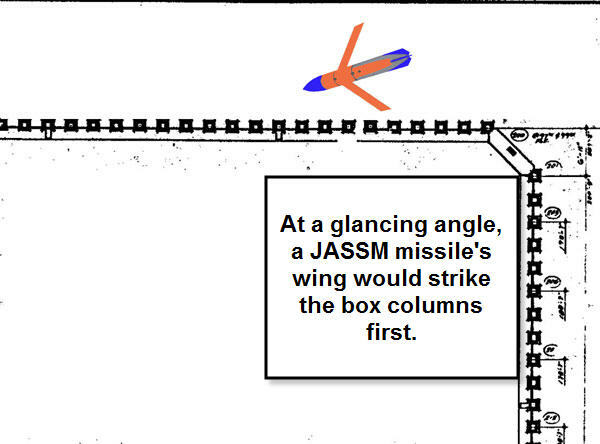 Official production didn’t begin until December of 2001, giving the authorities plausible deniability, but JASSMs used off-the-shelf technology from other tried and true missile systems so there is no question the technology was there. They look like planes, they are stealthy, they can fly in formation, and with planted targeting beacons, their margin of error would be next to zero. If the hole wasn’t cut by cruise missiles such as the JASSM, it was something very similar. The best way to hit parallel columns would be from the side, otherwise if you targeted them perpendicularly, you’d at best hit one column and possibly pass between two columns, so any competent missile jockey would have targeted them from the side, and that’s what the damage indicates. 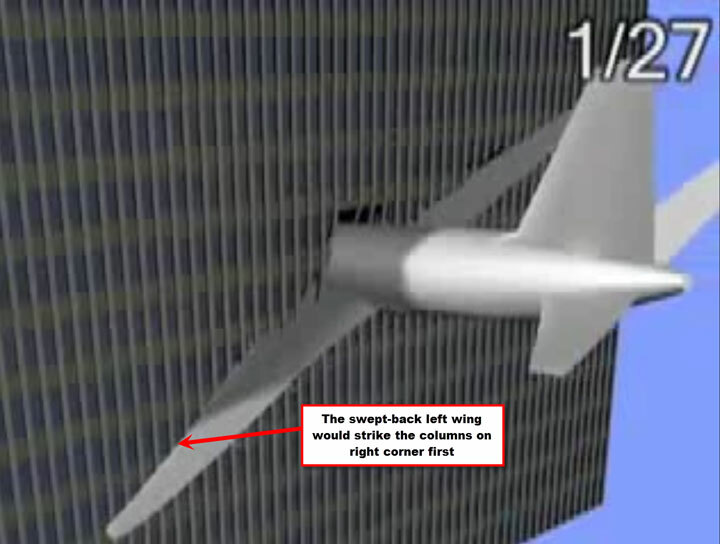 At a shallow oblique trajectory, it would be the wing of the missile that impacted first, which is why the cladding at the far left is only scored and pinched, but not severely damaged like the columns were further to the right. Multiple trajectories indicate multiple projectiles, and in the bent and twisted aluminum and steel you can almost see the warheads being deflected, either in front or behind the columns. Evidently the technology was there for a warhead that can account for the physical evidence at the scene of the crime; the means as it were. The motive was to apparently terrify the public into supporting long-planned aggressive wars, while destroying the white-elephants known as the WTC. The opportunity was at any time they pleased, but they chose 9/11, 2001. Who are “they?” Well ask yourself who had the means, motive and opportunity? Who controls the US airspace? Who controls the US missile arsenal? Who controls the media? Who has spent the last 16 years invading the world? Obviously 9/11 was run from the pinnacle of US power, but it wasn’t just a US operation. The US wouldn’t have attempted such a ruse without first ensuring other nations wouldn’t blow the whistle on them, especially the “enemy” nations that allegedly have every reason to do so. Nations like Iraq, China, Russia, North Korea, Libya, and Iran have their own critical thinkers who are well aware that in reality, mostly hollow aluminum jets can’t bore through concrete structures, burrow into the ground or slice through steel skyscrapers, and they would be the first people to recognize missile damage when they see it. But they all played along. That doesn’t mean everyone is involved but it does mean very smart people all over the world were duped just like the rest of us. These would also be the first people to know that if the leaders of all the world’s governments, media, military and academia were proclaiming planes can do such a thing, they would have no place to turn even if they wanted to blow the whistle. 9/11 is proof the New World Order is just the Old World Order with better graphics, and in case you haven’t noticed, the Old World Order was all about slavery. According to the damage evidence, and according to the laws of physics, the most likely suspects for creating the plane shaped holes are multiple cruise missiles launched in broad daylight. How the videos of the jet impacts were faked shouldn’t matter; the damage evidence alone is proof the videos are fraudulent. What began with Bush was continued by Obama who then passed the torch to Trump. The figureheads may change but the State Policy of ‘All War, All the Time’ never does. This suggests the leaders of all nations have more in common with each other than they do with We the People upon whose backs they rest, that they may compete and collude just like we little folk do, but when the system that keeps them in power is threatened, they will always circle the wagons and work together. They educate, entertain, inform and govern us, therefore everything we think we know, everything we think we relate-to should be considered the desired result of their propaganda. How long will it take for the penny to drop? If my conclusions are wrong, then someone has a better explanation, but to continue to ignore this evidence is a disservice to the people who will have no choice but to clean up our messes; for the sake of the future generations that will be forced to fight and die, it is beyond time to start speaking the truth. Steve, Amazing job, top-quality analysis and research, very convincing conclusions. 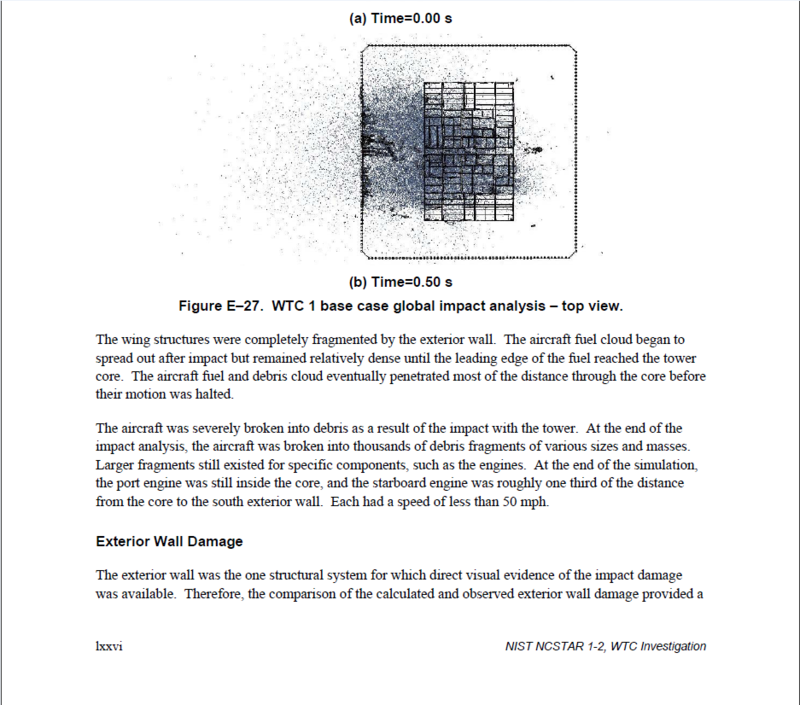 Had also been no planes, fake videos, explosives only, but now have expanded thanks to this analysis to understand that while previously-planted explosives destroyed WTC in controlled demolitions (the preparations for which took over a full year), it was Missiles that cut the holes where the supposed planes that never actually came close to the WTC were said to have hit. Also, much respect for emphasizing that NO ONE saw “planes” hit, even on TV, because the complicit media showed the “plane” approaching before, but then only the explosion, not showing any plane actually hitting, until the fakes were prepared later. Valuable work but your broad-brush comments implicating the entire 9/11 Truth movement in a conspiracy to lie is an unfortunate distraction. If my conclusions about the misnamed movement are incorrect I will retract them and publicly apologize just as soon as they address the taboo truths mentioned in this post. One doubt that the target in the JSSM test was near as thick as the damaged pillars pictured here. The idea that some of the damage was caused by a missile’s wing is ludicrous. Why is it assumed by the author that there was no one on the street? Why is that ludicrous? 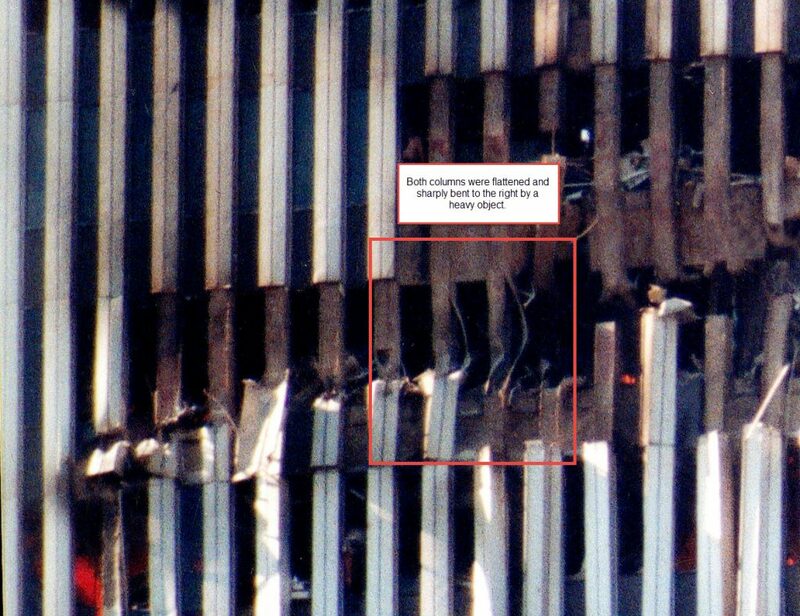 The pinched cladding at the far left of the north tower was caused by something very small and not very dense, but a few feet away steel columns were sharply bent to the right. If not a missile wing, what pinched the cladding? I didn’t say that. I wrote that the impacts were missed by the T.V. cameras, so why is it assumed they would be captured by amateurs? The lack of authentic, undoctored footage of the second hit, to me is the biggest remaining mystery about 9/11, and is an ongoing phenomenon in faked events. The first hit came as a surprise, so the conspirators could perhaps take the chance and have something else than a plane, or nothing hit the tower. But the second hit came as one tower was already burning, and tens of thousands of people in and around Manhattan should have had their eyes fixed on the WTC by then, and those with a camcorder or photo camera should have started filming/photographing by then. How on earth could all these people miss the object that hit the second tower or the lack of it, so all the world got to see was doctored TV footage? What if someone on a boat had a camcorder and simply pointed it at the WTC after the first hit, and would have captured the explosion with no plane hitting it. Would his camcorder have been confiscated? This mystery is also found in faked events since 9/11 – the conspirators magically avoid being recorded doing their dirty deed, all the relevant footage is made and released by themselves. They would never attempt a 9/11 style event today, now that everyone has a camera on their cell phone. That was not the case on 9/11 when YouTube was just a gleam in the eye of the Intelligence services and all they needed to do to control the narrative was control what the media outlets reported. There are not any people who think planes were actually involved in 9/11. The evidence of that is in the videos. Planes can not and will not fly into buildings like they tried to imply. It is impossible and 17 years after the only people who still believe that either never watched the videos or are as fake as the planes. Utterly pathetic argument. 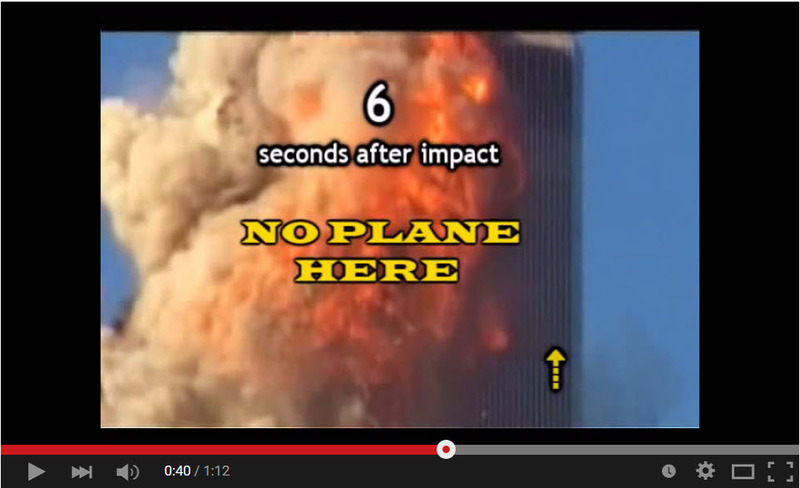 Planes did not fly into buildings no matter the number of videos or witnesses. Judy Woods has been exposed years ago dead horse. I like where Steve has gone and see no flaws in his recent evidence and speculations. How he can waste his time arguing with garbage spewing trolls shills and utter nonsense is beyond me, but bravo Steve excellent work..bar none. Thank you – but I do think the majority of people still believe that mostly-hollow aluminum jets really did burrow into the ground, bore through concrete and slice steel. I can’t imagine how any grownup could believe such a thing but it is a testament to the power of propaganda. As far as the trolls go, it is tiresome, for sure. They might “beleieve” that planes were hijacked and crashed but they know. They can’t swallow it. It’s still comfortable to avoid it all. I marvel at how crappy the video quality is for a network news helicopter. You have no idea what physics is, or what a vector is. This web page is fake news, spreading lies and essentially trying to apologize for 19 terrorists who were solely responsible for all the murders and destruction on 9/11. Spreading dumbed down lies, unable to do physics. Why do you lie about 9/11? 17 years and you can’t figure out 19 terrorists did 9/11, as you mock the murder of thousands with idiotic claims of missiles not seen on 9/11. Yes an idea of physics is what you are not grasping here Jack. Please include an idea of physics with the damage we have been told was caused by planes on 9/11. For planes to glide through steel columns, disappear into the ground or tunnel through Pentagon walls you need to refer to loonie tubes cartoon physics. We prefer real life physics that follow real life laws of physics.